Saturday, May 4, 2019 1:00 p.m. to 6:00 p.m. 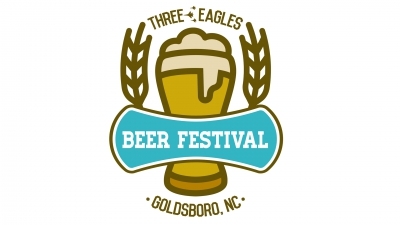 The Three Eagles Beer Festival, sponsored by the Goldsboro – Three Eagles Rotary Club, a non-profit civic club, is having its fifth annual fund-raising event to raise money for local non-profit organizations and to support Rotary International. Local non-profits and charities supported have included: Meals on Wheels, Literacy Connections, Mephibosheth Project Incorporated, Impact Teens, Y's Men program at the Family Y, Long Term Disaster Recovery, Wayne Community College Scholarship and others. The Three Eagles Beer Festival features craft beers distributed by both local and regional distributors. The beer fest typically provides approximately forty different beers for participant tasting. The 2019 beer festival entertainment will feature T. Davis, a guitarist/singer/songwriter from eastern North Carolina. The food trucks this year are: Brewmasters, Skullies Street Q, and McGrady Grill. They will provide a variety of great eats at this year's event. The Three Eagles Rotary Club will be very appreciative to have you as a Sponsor for this year's event. For more information, contact Dean Nelson at 252-599-1956 or nelsondp@suddenlink.net.